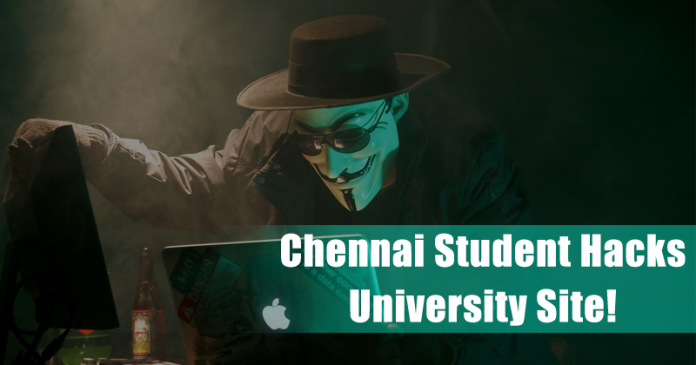 Recently, a student from Chennai managed to hack into the admin pages of a cyber forensics center at the University of Madras. He also confessed his passion to work in the field of INFOSEC (information security) in the email sent to a professor. If we look around, we will find lots of hacking stuff going on. We have seen how hackers utilize their skills to do illegal things over the internet. Recently, a student from Chennai managed to hack into the admin pages of a cyber forensics center at the University of Madras. The name of the student was not made public. However, according to the student, he has hacked the admin pages of cyber forensics center to showcase his hacking expertise to the authorities and persuade them to admit him to a course offered by the center. Well, the university’s Centre of Cyber Forensics and Information Security offers an M.Sc degree which is one of the famous courses with job offers from top banks and financial organizations. The university had only 25 seats on offer, the center received around 350 applications. According to the authorities, the student who managed to hack the admin pages appeared for an entrance exam conducted by the centre, but had failed to clear it. Later, the student sent an email to professors in which he mentioned that he intended no harm but just wanted to report the existing weakness in the university website. He also confessed his passion to work in the field of INFOSEC (information security) in the email sent to a professor. The student also attached the screenshots of the vulnerable admin login pages which he was able to break into. He also said that he always has dreamed of studying cyber forensic sciences and this hacking attempt was just to display his hacking abilities. He also requested the authorities for a chance to be registered as a student in the course. The course also covers aspects of ethical hacking and security training. The course actually prepares students for cybercrime detection and prevention.